Secure connection between OTM (SaaS) and a local installation of SDL Trados Studio Pro via the Internet. Our middleware tool, the "OTM SDL Trados Studio Connector", makes quotation calculation even easier. Install this little application on your computer with SDL Trados Studio Professional, and project files are taken directly from the Online Translation Manager (OTM) and passed to SDL Trados Studio, where a project and/or packages and translation memories are created automatically. Existing TMs can be used for the analysis of the source files. 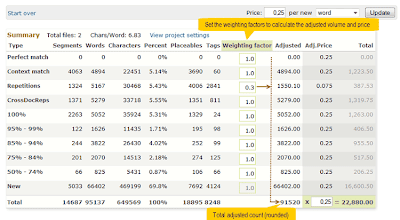 The Connector uploads the analysis files produced by SDL Trados Studio to the relevant project in OTM, where the quotation’s line items can be generated with just a mouse click. The Connector is not included in the regular OTM license. If you are interested in using the software, please contact LSP.net support. 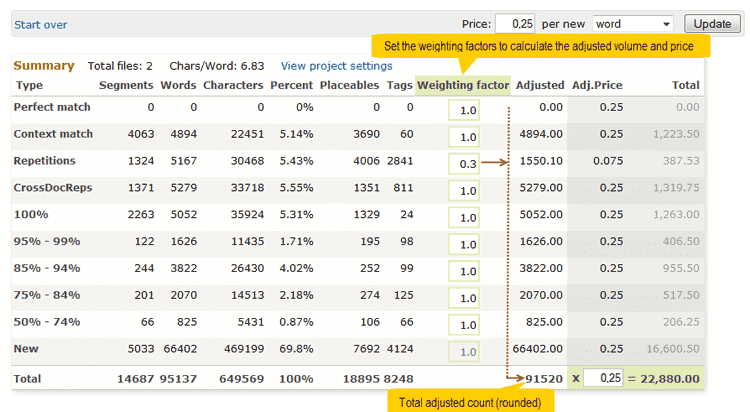 How do you use a CAT analysis to determine the price of a translation project? Most colleagues probably use an attentively maintained Excel spreadsheet. With lots of concentration and a quick mouse, they are happy to have the (hopefully) correct answer within minutes. But if the project contains several files and a separate price is required for each one, even copy & paste pros sometimes get lost in the process. And as the pros also know, the irresistible customer need for quantification and prices in standard lines is the maximum penalty. LSP.net has developed an online tool that saves time and soothes nerves. It speeds up the process significantly and yields precise figures: upload the analysis file, enter the price per word or standard line, and click on the Start button – instant results. Then set your weighting factors as required – process completed! Unrestricted use, free of charge. Currently, the tool can only process SDL Trados analysis files (XML) from Studio 2009 and 2011 – but it will gradually be expanded to include analysis files from additional CAT environments. Visitors to LSP.net are invited to forward their wishes and suggestions for improvement to the developers using a convenient online form. Personal settings can be saved in a browser cookie (on the user's computer), so users are not required to enter the price and weighting factors again every time they revisit the website. The results can also be printed as required. Data privacy protection: LSP.net saves neither your data nor your files. After it is uploaded, the analysis file is used for a few seconds to read and display the count data and display it in the browser. Then the analysis you upload is deleted immediately and permanently from our server. The release of OTM 6 also includes the calculator tool and will enable lines items for quotation to be created with just a click.